I’m so excited to share this news! InD’Tale Magazine awarded a Crowned Heart for Excellence to One Small Chance! 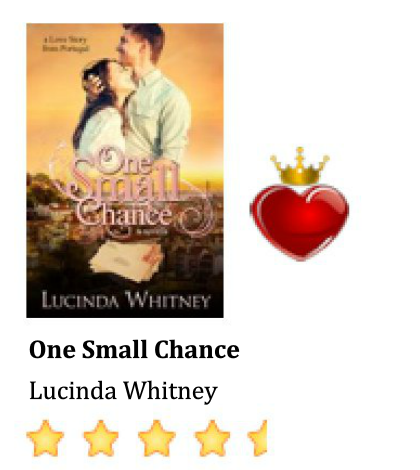 You can read it on page 120 of the November 2016 issue, here: http://magazine.indtale.com/magazine/2016/november/#?page=120, or on the website here: http://www.indtale.com/reviews/inspirational/one-small-chance. The Crowned Heart also makes it an official RONE Award semi-finalist for 2017 and in the Spring, it moves on to the reader voting round in the award process. Wish me luck!